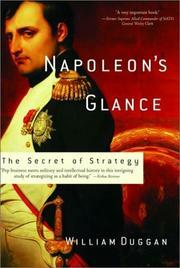 Pop business meets military and intellectual history in this intriguing study of strategizing as a habit of being. Look for red hats in a crowd, writes former Ford Foundation executive and Columbia Business School visiting professor Duggan, and you’ll almost certainly find them. That “confirmation bias” poses a danger for anyone reading the historical record to look for patterns—but, he gamely remarks, it also shows, at the very least, “that red hats exist.” The red hat here is Duggan’s overarching notion of Napoleon’s famed coup d’oeil—the telling glance, or, as the German strategist von Clausewitz defined it, “the rapid discovery of a truth which to the ordinary mind is not visible at all or only becomes so after long examination and reflection.” For Napoleon, the key to success was to study in close detail and replay battles of the past, looking for the critical moment at which the certainty of victory became apparent and seeking to re-create that moment in the present; his theorizing yielded the doctrine, studied by military officers ever since, that the successful leader will, in the words of former NATO commander Wesley Clark, “bring the enemy to battle at the time and place of your choosing, where you had the advantage and could finish him.” By Duggan’s account, not only generals benefit from that coup d’oeil: Pablo Picasso had the knack, and it enabled him to maneuver his talents onto ground carefully prepared by the likes of Henri Matisse, just as Martin Luther King Jr. was able to read the scent of change on the wind and, with the aid of many an unsung lieutenant, move the civil-rights struggle to more favorable ground. Duggan sometimes stretches the facts a bit to suit his thesis, but with no harm done, and he turns up plenty of fruitful case studies—including a few pleasant surprises, such as his inventive reading of a medieval African epic and his revisionist take on the publican Saul’s self-reinvention as the disciple Paul on the road to Damascus. More literate and convincing than most of its kind: a good candidate for business-minded readers seeking something for airplane or nightstand.